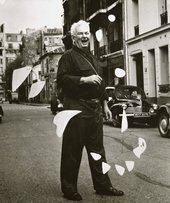 Need to explain Alexander Calder to a kid? 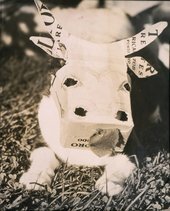 Head over to the Tate Kids blog, for a simple and fun introduction..
Was he always an artist? Calder always enjoyed making art. However, he trained as a mechanical engineer at the Stevens Institute of Technology in his early twenties. He began to pursue painting in earnest a few years after receiving this degree. He is said to have chosen mechanical engineering arbitrarily, simply because someone he befriended was going to study that subject. Nevertheless he excelled at mathematics, and the experience was later applied to his unique and ingenious artistic approach. Essentially his mobiles moved, often lacking the traditional base or pedestal which would usually anchor a sculpture to the floor. Stabiles were simply sculptures which were stationary and placed on the ground. These were often made on a colossal scale. It was a very exciting room. Light came in from the left and from the right, and on the solid wall between the windows there were experimental stunts with colored rectangles of cardboard tacked on …. What was his favourite subject? I love the space of the circus. I made some drawings of nothing but the tent. The whole thing of—the vast space—I’ve always loved it. 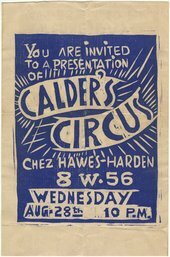 When he moved to Paris in 1926, his interest quickly escalated into the creation of his own miniature Cirque Calder, fashioned from an array of found materials. He would pack this into two suitcases and give performances to his friends. Soon the two suitcases became five, and Calder began to make some modest earnings from the venture. As such, his career as an artist began in a very unusual way. Pen and ink on paper, 10 1/4 x 30 1/8 in. Was it all just fun and games? What was his favourite drawing material? 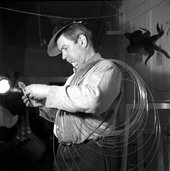 Calder always carried wire and pliers with him so that he could “sketch” in his favourite material. This has come to be known as ‘drawing in space’ because he would literally use the wire to create a drawing in the air. What was his favourite colour? What were his thoughts on sculpture? Out of different masses, light, heavy, middling- indicated by variations of size or colour- directional line - vectors which represent speeds, velocities, accelerations, forces, etc…-these directions making between them meaningful angles, and senses, together defining one big conclusion or many. Each element able to move, to stir, to oscillate, to come and go in its relationship with the other elements in its universe. It must not be just a fleeting “moment” but a physical bond between the varying events in life. Which are his key works? Aside from Cirque Calder, which is universally loved, the following artworks are perhaps his most iconic. The piece can still be seen at Fundació Joan Miró in Barcelona,but it is now displayed behind glass due to its high toxicity. 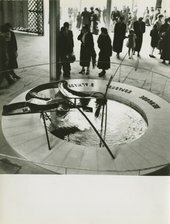 In 1969, Calder’s monumental public artwork, his stabile Le Grande vitesse was installed in the plaza outside City Hall in Grand Rapids Michigan, USA. The title is a tongue-in-cheek French translation of the name ‘Grand Rapids’ which also means ‘Great Speed’. The artwork has caused great controversy from the word go. When locals discovered the plans there was a hot debate in the local newspapers about whether the project should go forward. 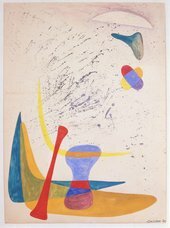 Even to this day many people do not appreciate Calder’s vision. Nevertheless the Plaza has become known as Calder Plaza, and there is an annual arts festival on the artist’s birthday. Le Grande vitesse is even seen on street signs and the city government letterhead, placing the artwork at the heart of the city’s identity. How did he transport some of his artworks? Calder developed the idea of dismantling even large sculptures so they could be posted unobtrusively avoiding customs problems. He essentially designed flat pack artworks. He would also send detailed numbered and colour coded instructions along with the piece so that it could be reassembled correctly on the other end. Sheet metal, wire, and paint, 7 1/4 x 6 1/2 in. “One cannot describe his works- one must see them” said separately by Bruno E. Werner, ‘Portraits, Sculpture, Wire Forms,’ Nierendorf Galerie, Deutsche, Allgemeine Zeitung, April 1929 and by E. Szittya, ‘Alexander Calder’, Kunstblatt, June 1929.